Trailer Amnes(t)ie from Action Zoo Humain on Vimeo. 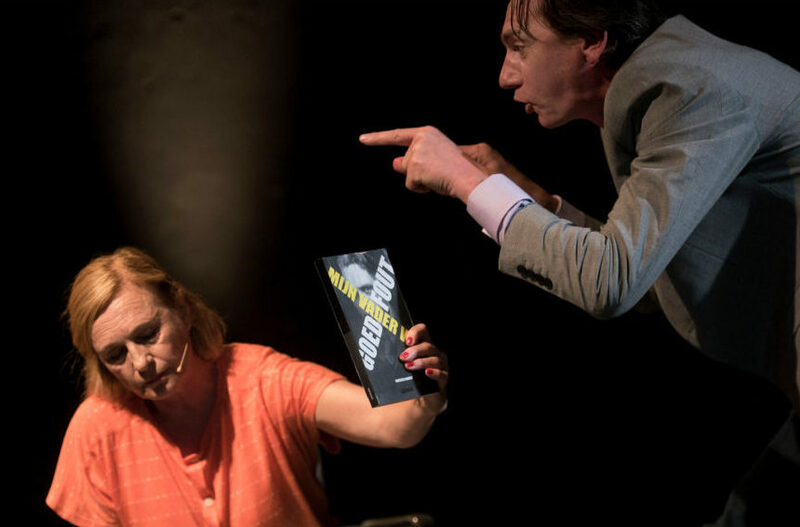 Dive into the television landscape with Action Zoo Humain through the unprecedented talk show Samen door één deur (‘Together through one door’). Amnes(t)ie tackles both our collective past and today’s precarious socio-political reality: do people who have left Belgium to fight in Syria and who subsequently return deserve a second chance in our society? Can we learn lessons from the reintegration of collaborators after the Second World War? Must we forgive and forget? And is there a possibility of reconciliation? Forget the idle talk, the conflict, the feigned interest. Samen door één deur plays the radical reconciliation card, with Bert Gabriëls as the host. The evenings guests: the daughter of a Flemish collaborator and the mother of a person who fought in Syria. Can you make mutilated Flemish pasts resonate with wrecked Muslim families today? And can a production give you the jitters because of shattered taboos and at the same time make you roar with laughter because the situations are oh-so-absurd? 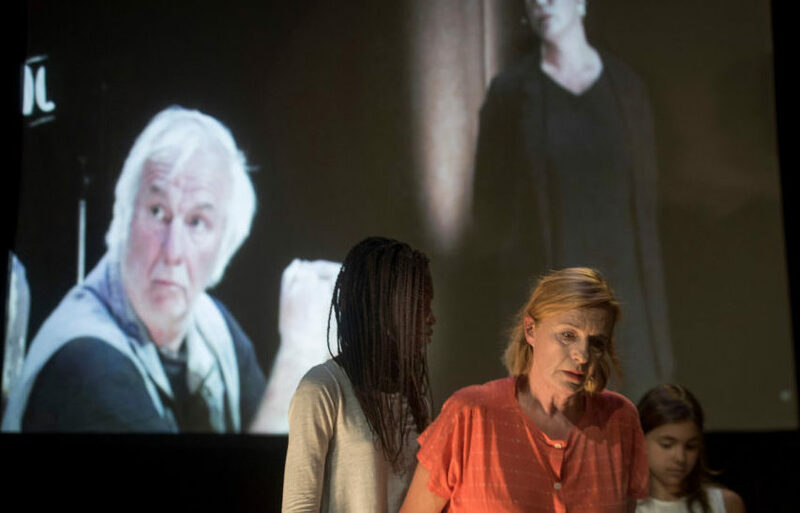 In Amnes(t)ie(Amnesty/amnesia), a coproduction with Tom Dupont, Chokri Ben Chikha brings the daughter of a Flemish Eastern Front fighter face to face with the mother of an IS fighter in a recording for a new television show Samen door één deur (Together through one door). Ben Chikha and his team build up the production from several layers: from the imbecile television show and the final rehearsal of the sham tv team with the (real) children’s choir and orchestra to the camera cuts when the situation on the set gets out of hand, while in-between the recordings the two wrangling women do manage to muster a degree of mutual understanding. In the ‘therapeutic family line-up’ the audience is brought onto the stage floor. These ingenious constructions provide Ben Chikha with a way of speaking out about weighty social matters. 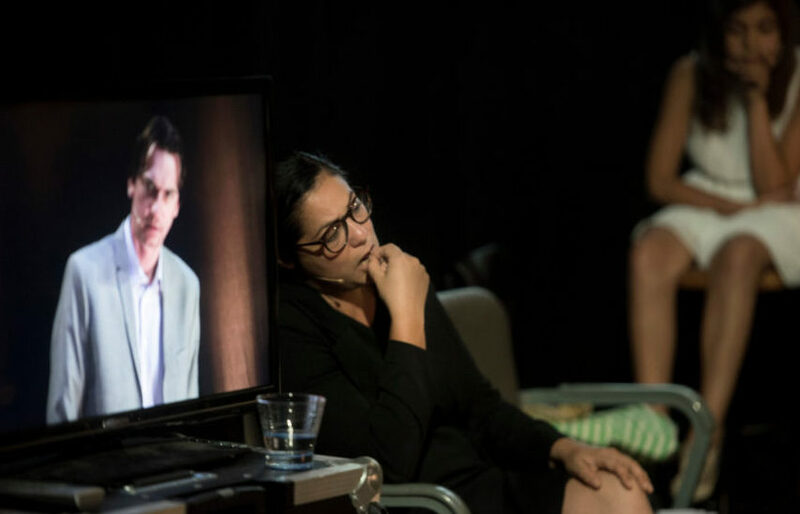 Marijke Pinoy plays an unforgettably socially inept woman, drowsy from tranquillizers, in a scene that is touchingly slow and against all camera-genic guidelines. But behind her naivety there is common sense which is so much more sincere than the whole human interest programme would have us believe. The situation becomes increasingly hallucinatory, idiotic and hilarious. And more distressing, too, because behind the farcical stagings is a reality that is no laughing matter. Deep emotional suffering awaits all those confronted with humiliation, exclusion and racism: that is the crux of the caricature. Only you never know for certain if the makers really do have their own construction under control. And it is that uncertainty which allows the spectator to escape on cue the leaden weight of the subject. At the end the whole room is involved in the dilemma of forgiving and not forgiving… A lesson in double perspective, and a light-hearted plea for empathy. Well, perhaps not light-hearted. Chokri Ben Chikha is more audacious, but very sensible and entertaining.